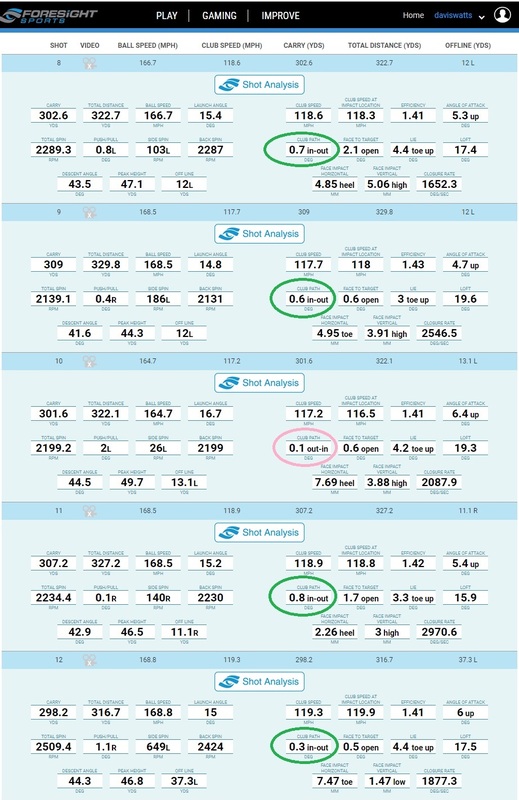 For those who want to know why a proper swing plane is better than, say, an over-the-top plane, I can show you graphically why that is. Now, let me show you something interesting with regards to swinging on-plane vs over the top. Now that’s not good, even though I probably hit this ball perfectly with my power fade (I don’t save bad shots on video except for a specific reason, and this wasn’t one), and the reason is that I would have had to time everything perfectly, since my hands are only on the plane for a split-second at impact. 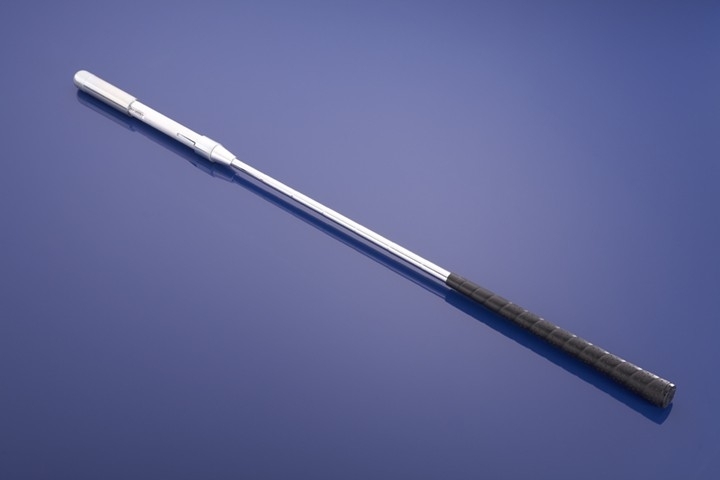 If you want to see what an in-to-out impact is, watch the club shaft and head – before impact, they are inside the plane, and post-impact, they move outside the plane line. So, not only was I not over-the-top here above, I didn’t even have to “drop” anything “into the slot,” as my hands never leave that plane line once they touch it. It’s better to “drop into the slot” than to be over the top, but I bet you’d all agree that being “in the slot” to begin with is far better than having to find it on the down swing with a big compensation move. Now, this is something you can’t do purposefully, because of course, you’re looking at the ball and not at yourself from down the line, and you can’t manipulate the hands and club on a swing that reaches 120 mph impact speed to begin with. When you get a swing path like the above, nearly perfectly neutral, then you are going to hit the ball where you’re aiming, unless your alignment is off or you do something to prevent a square face at impact. 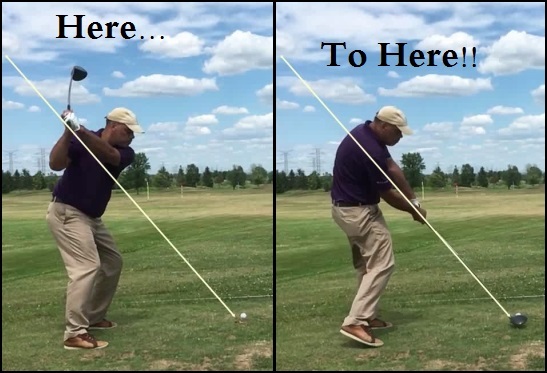 That’s why the proper address stance and the proper pivot mechanics are crucial – once you’re in motion, you’re basically going to make the swing you’re going to make, and although you may feel as though you can change something coming down, it’s more a post-impact reaction that you’re feeling when you try to adjust something pre-impact. This is also why you will see a player make a very exaggerated move post-impact on TV when they make a bad swing, and guess what? Nothing in that post-impact move does anything to save the shot, does it? 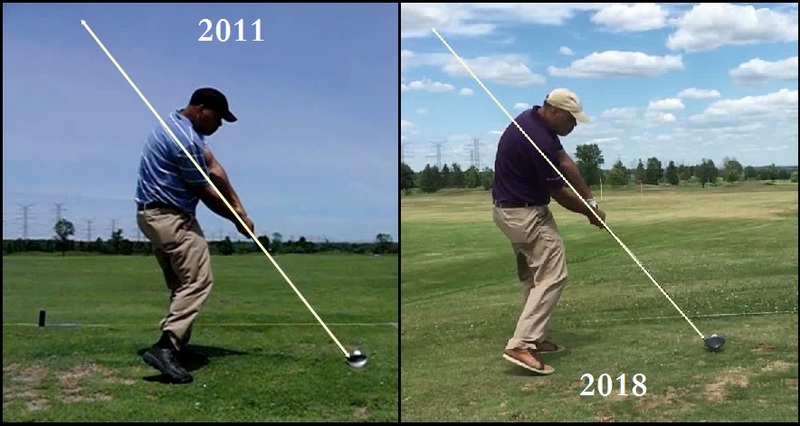 I have never deliberately tried to swing keeping my hands and the club on the plane line, because it’s something I just noticed today while looking at swing planes. But what made it possible? The newer, tighter back swing pivot and top position and the proper MCS stance, ball position, grip and mechanics! That is a good downswing DJ. Any OTT swing will produce dodgy results. What do you think of DeChambeau swing? Can’t argue with his results lately although his stiff arm swing doesn’t look too fluid to me. Years ago a friend of mine had a stiff arm swing like that and he always looked more like a tin soldier. I think Bryson’s success is because he finally learned how to putt instead of fiddling around with those other silly methods. I don’t really have any opinion of DeChambeau’s swing with regards to what he’s doing other than the fact that he’s swinging in the modern, planted-leading-heel and twisting lower back style. Once I see that, I don’t really care what else is going on, the swing is mechanically unsound. For someone who obviously thinks of himself as a swing mechanic, I’m surprised he hasn’t got around to figuring that part out, which I did after a very short time researching the swing. Until he changes that, the swing is flawed and it doesn’t matter to me whatever else he’s doing with it. Hi DJ. You’re a master at self-discovery! I couldn’t help but notice that your trailing heel is lifting substantially at the 3:00 position. Does that have anything to do with your on plane swing? You’ve talked about keeping the trailing foot more planted recently so I’m confused. So that’s your “challenge question” of the day. Hello Bill! You are correct, the heel is up and that’s what I’ve been working on with regards to the tighter pivot since the end of the season. You’ll see that it’s not anywhere near as high as in the 2011, but my goal is to have it completely flat or just coming up at impact. If I’m correct with the work I’ve done of solving my personal issue of exactly what is “tight,” prepare to see something very different come 2019!